In the year 2011 Alvi Armani embarks upon a new phase. I am pleased to announce the introduction of a new generation of Alvi Armani doctors and clinics - Beverly Hills, Dubai, and Buenos Aires to serve our valued patients worldwide. I have personally mentored and trained Dr. Baubac Hayatdavoudi at Alvi Armani Beverly Hills and Dr. Raimund Forster from Austria at Alvi Armani Dubai; and Dr. Juan Jáuregui and Dr. Esteban Zalazar at Alvi Armani Buenos Aires. Four out of the preceding six doctors and associates are actually my patients whom I have operated on. These physicians have been handpicked from hundreds of applicants for their artistic skill, clinical knowledge and intricate dexterity. They have completed a rigorous fellowship in Vitruvian methodology and design. Personally training the new generation of doctors, over the past few years, has been a pleasure and ensures Alvi Armani continues to deliver the same high standards I have set. It has been twelve years since the launch of Alvi Armani. From its inception, Alvi Armani has made major advancements in hair line design, density, larger FUE sessions, and our unique Vitruvian Design Method, recognized worldwide by its trademark - undetectable natural results. The advancements made have benefited patients worldwide and I am highly gratified to have been involved in this critical phase of change in the hair transplantation field from 1999 onwards. Alvi Armani has lead in innovation and has been followed by others. Today better procedures are being performed worldwide due to our contribution to the field. Resulting from our approach - hair line design has become more age appropriate, higher number of grafts are transplanted, and better densities are obtained. Due to patient demand and its technical superiority, the FUE extraction method will become the standard in hair transplantation. Alvi Armani has combined a high degree of advanced technical innovations with a high degree of artistic skills to consistently produce pioneering results, which our patients expect, and have become accustomed to. Hair Transplantation is more art than science. The variety of options to the patients is similar to a variety of tastes in art. In the end it is the patient - or viewer - who decides what is appropriate for them. 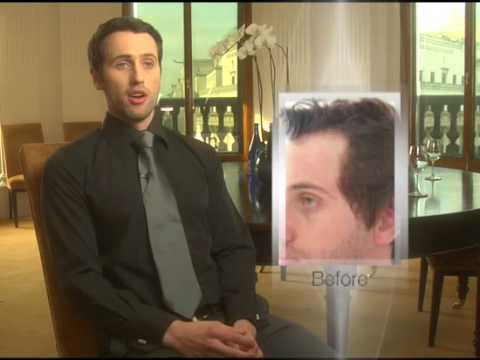 The function of the hair transplant doctor is to guide the patient, based on experience, to what would be the best suitable application of the procedure in their particular case. Alvi Armani has patients from all walks of life, including "A list" Hollywood and Bollywood actors, singers, and models, on whom higher densities and a more youthful hair lines are important for their careers. Equally challenging are Class 7 patients who are completely bald, where design must make up for a smaller donor supply. There are thousands of happy Alvi Armani patients whose lives have changed due to the improvement in their self esteem and their self worth that our transplants have produced. I have always emphasized to patients that donor hair density is the patient's "money in the bank". You always need it in the future as hair loss - similar to aging - is an ongoing issue. The donor area is the most important long term "economic" consideration for the patient. If we can work to increase this, transplants will reach a new peak. For this reason, my main area of work in the future years will be in hair loss research. The objective is to develop better cellular therapies and pharmaceutical agents to treat this disease that affects so many men and women. A new era begins for Alvi Armani, as of April 2011. I will be retiring from performing hair transplantation surgery on a daily basis except VIP and special request cases. I will be primarily dedicated to leading the Alvi Armani team in training and research. All procedures will be performed by our team of excellent physicians at each of the Alvi Armani locations. I have selected and trained a superb team of physicians and outstanding surgical assistants behind them who will carry on performing hair transplants with the trademark Alvi Armani technique at the highest standard. My main focus will be on research and crossing new frontiers in the area of hair loss, seeking to attain a solution for this problem that affects so many people. I will also be dedicating some of my time to charity work, and assisting people in need. I would like to thank every one of the patients we have operated on over the years. We thank you for putting your trust in Alvi Armani. Whether the patient was a famous actor, a royal family member, a CEO, a famous football player or a young man from a village in Italy or Spain, we have performed to the highest level in every case. Along the way we have been educated in different cultures, religions, and lifestyles. In the end, we should all be more tolerant of each other and help those most in need. I feel this is the fundamental point of being a dedicated doctor, a "patient patient", and a beautiful human being. To all potential patients, please contact one of our clinics or consultation centers around the world anytime. Our courteous and knowledgeable staff and doctors will take you through the process, giving you a comfortable and caring environment where we aim at fulfilling your needs at every step. We understand how you feel and we are here to assist and care for you. I do think that, 50 years from now, when people look back at the hair transplant industry it will be a known fact that Dr. Antonio Armani and alvi armani revolutionized the industry and moved it forward at lightning speed that resulted in many patients benefiting from his remarkable skills that are unique and will stand out forever. Just like Steve Jobs revolutionized the computer/smart phone/tablet industry and Jamie Dimon and Warren Buffet revolutionized the banking and financial industry, your defiantly a legend like them. Thank you again for being my doctor"
We look forward to continue serving all our patients from around the world at our Alvi Armani centers. In the 12 year span of my career in hair transplants my team and I have performed over 10,000 procedures worldwide. Art cannot be measured in words, our results speak for themselves. I leave you with some souvenirs of other art that I have also done along the way.